On June 30, 1934, President Franklin Roosevelt signed Executive Order 6777, which both established the National Resources Board and abolished its predecessor, the National Planning Board (an advisory unit to the Public Works Administration). The new agency’s primary initial responsibility was the completion of a comprehensive report on the land and water resources of the United States, with a particular emphasis on the social and economic aspects of government policy. A key aspect of the effort focused on recreation, including documentation of existing facilities and opportunities as well as potential future recreation needs in a country become ever more urban and mobile. The Land Planning Committee of the National Resources Board charged the National Park Service (NPS) with completing the recreation study. Only one year earlier, President Roosevelt had consolidated all national parks and monuments, all military monuments, 11 national cemeteries and the national capitol parks into a combined National Park System, raising the agency’s profile and expanding its management responsibilities. 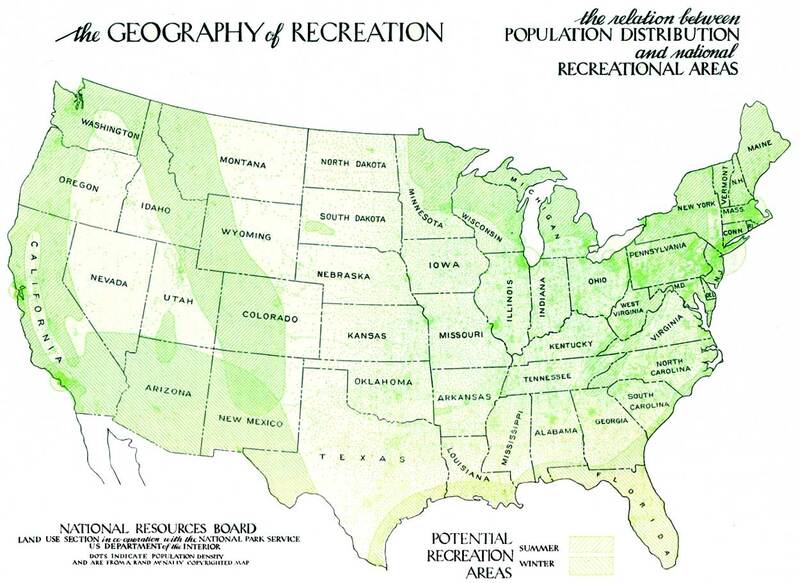 Though only allocated a few months to complete their portion of the broader land and water report, the NPS managed to submit a detailed study, “Recreational Use of Land in the United States,” by November 1, 1934. 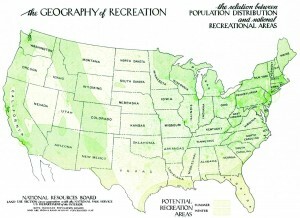 The document included a brief history of recreation in the United States, offered a survey of available federal lands, evaluated the possible economic impacts of recreation and assessed existing local, state and federal recreation facilities. Interestingly, the report also called for federal ownership of lodges, transportation and other “concessions” in existing national park lands. The study is important as it represents one of the earliest (if not the earliest) national assessments of recreation opportunities. It also provides evidence of a more expansive NPS in the process of re-considering its mission and potential visitor base.